If you don’t know what you want to be when you grow up, it’s not the end of the world, says Senior Support Worker Deacon Fisher. He encourages young people to explore their options when seeking a career path, because there is a whole world of opportunity out there. “Take your time and find out who you are before jumping into a career which you may eventually find mundane,” he says. Deacon on the Community Connections Wellington graduation ceremony on 8 March 2017. This is some of the advice Deacon gives young people in his role with Community Connections in Wellington. But he also walks his own talk. After completing a BSc majoring in Anatomy with a minor in Maori Studies he realised his true passion lay in community health and wellbeing. “Health and wellbeing has always been a passion of mine. I just had little idea where or how I wanted to enter the industry. After finding a passion for social health, I decided to look into areas where I could enter the social and community health fields,” shares Deacon. He contacted Community Connections who scheduled him for an interview. “During the interview process, my employers said that they wanted people who were looking to develop professionally and I was interested straight away. I was offered the opportunity to study and grasped it,” he said. 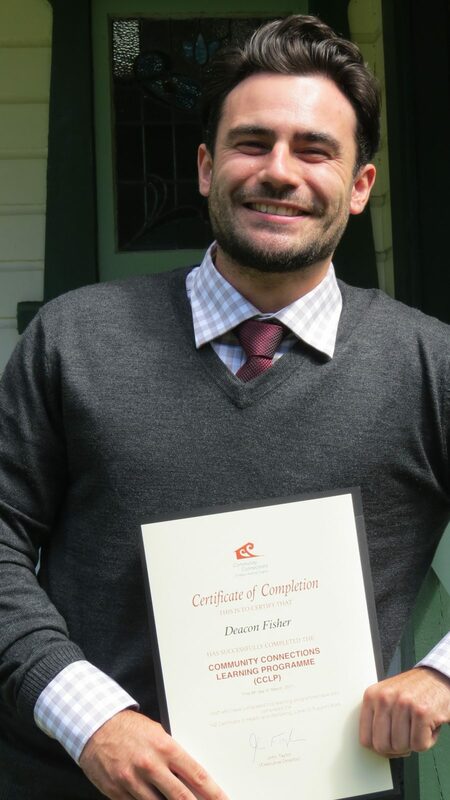 He learned and worked his way to complete a New Zealand Certificate in Health and Wellbeing (Level 3) (Support Work). This is one of many qualifications offered through workplace training or on-the-job training to recognise and develop the skills of their staff. Deacon now loves his job where every day is different. “In this role, you develop relationships with the individuals and the families of those you support and with that sense of community involvement, there is a sense of pride in your work. His parents have been supportive in helping him choose this career path. They have been instrumental in helping him achieve what he has today. He also received constant support from his employers and colleagues in developing within his role on-the-job. Deacon is not done yet. He has learned practical skills through workplace training but he wants to keep improving himself to be able to contribute to the community. He is now working towards his Postgraduate Diploma in Public Health, at the Wellington campus of Otago University. He also just got promoted as a Team Leader. 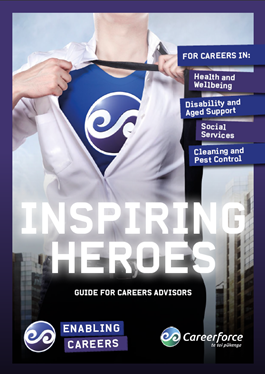 Download a copy of the Inspiring Heroes Guide which lists 15 careers in the sectors we support. It highlights what a worker can expect to do in a typical day, what characteristics and aptitudes suit these roles, how to get qualified and what the career pathways are. The health and wellbeing and social and community industries have many rewarding careers. Contact us to get in touch with our Apprenticeship and Vocational Pathways Advisors. Give us a call at 0800 277 486 or send us a message at info@careerforce.org.nz.